Here’s just a quickie for a Sunday morning. It’s another bread recipe. I have yet to buy a loaf of bread at the store, and it’s getting on three months we’ve been in the country. I am finding in the country that a more functional shape of bread makes most sense, unless you’re having company. By “functional” I mean sandwich loaf-shaped. Beautiful bread brought fresh to the table is a marvellous thing, but sometimes you have to be practical. There’s only two of us here so a loaf has to have more uses than one meal. That’s where sandwich-shape comes in. It fits neatly into the toaster for morning breakfasts as well as to make sandwiches. But I hate the thought of giving up on tasty bread. A fresh loaf is delicious, no matter what kind, but I wanted to see what would happen if I used a classic French bread recipe as a loaf. I love the flavour of baguette. So that’s what I did. It actually worked quite well. The crumb is quite similar, and it has some holes. My method of overnight raising is a godsend. It takes practically all of the work out of bread making, and all but 2 minutes of kneading. It’s really easy. If you’re of a mind to have fresh bread on the weekend, why not try this recipe this coming Friday night? In the morning you’re all ready to go. 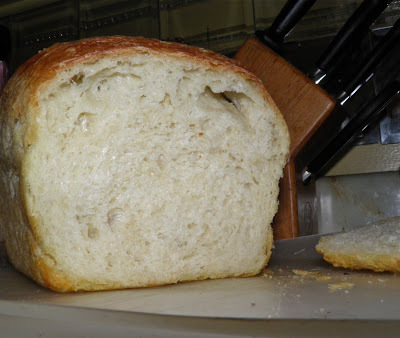 In about an hour or so after waking up you’ll have fresh bread from the oven! Combine the four ingredients in a bowl and mix well. Then knead briefly until all of the flour is incorporated from the bottom of the bowl. Cover with plastic wrap (or place the whole bowl in a plastic grocery bag and tie), place a towel on top and let rest on the counter overnight. In the morning punch the dough down, knead for 2 minutes and place in a well buttered 5” x 9” oven-proof baking pan. Let rise for about 45 minutes until doubled. While it is rising preheat the oven to 425°F with a pan of water on the bottom rack. 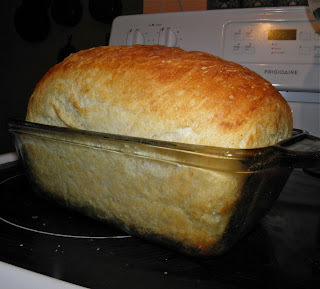 Bake the loaf for 10 minutes, remove the water and then bake for an additional 20-25 minutes. The loaf will be hard on top and sound hollow when tapped. Remove from the oven, take out of the pan and let cool.